Now available!! Fresh seafood, delivered weekly with your CSA bounty via Brooklyn-based Village Fishmonger! Low-mercury options are available. Sign-up today! Questions, Contact Us! Order your next Lewis Waite products for delivery on Thursday, November 7th. Note the NEW ORDER DEADLINES. Please be sensitive to the busy farmers and order on time. Late orders may not be filled. Place your order now! I think we’re finally turning a corner towards some real autumn weather this week. The farm is still bustling, but things do start to slow down just a bit by the end of this month. The tomatoes in this week’s share will be the last of the season. I’m still amazed that we’re harvesting so many tomatoes this late in the season. If you want to save them to use in soups this winter, just chop them up (with skins on!) and pop in a ziplock bag in the freezer. If you ordered, pick up your LWF goodies today! Ready, set, grill! Join us for the CSA’s Annual Cookout on Saturday, July 13th! Bring friends and family and your own protein/veggie to grill and a dish to share—we will provide non-alcoholic refreshments, chips and all the BBQ gear. Please, ONLY NON-GLASS containers. Volunteers are needed to help run the BBQ! Sign up for a shift at VolunteerSpot. 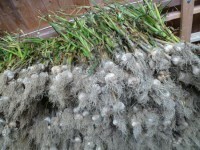 I was so happy to smell the Cipolini Onions in the barn yesterday! They’re a beautiful early variety, aka “Little Onion” in Italian, best eaten caramelized in a dish or simply roasted in the oven. (See recipe below.) Over the weekend, we grilled up the Kohlrabi and Zucchini with a delicious parsley sauce courtesy of Yotum Ottolenghi. (Recipe below.) I was surprised by just how good the kohlrabi was on the grill! And I just can’t get enough of the grilled (or seared) Radicchio—can you? I’ve hoarded about 6 heads of it in my fridge so I can enjoy it every night for dinner. A little overkill? Perhaps, but I only get to enjoy it a few weeks every year! The Romaine Lettuce is so crisp and sweet. I think a nice cool Caesar salad is on the dinner menu one night this week. Another week of hot dry weather means a lot of irrigation here on the farm. 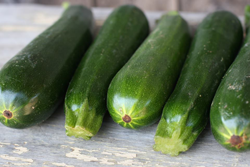 It also means that our summer crops are growing like crazy, which is good news for you melon, tomato, and eggplant lovers… Did I mention zucchini lovers? I know there are many of you out there who are thrilled to see them make their first appearance in this week’s share. Zucchini plants don’t know when enough is enough, and they produce heavily for weeks on end. We have to pick the same field every day to keep up with them—they grow that fast! Deadlines to order your next delivery of Lewis Waite products start Friday, June 21st for delivery on Thursday, June 27th. Note the NEW ORDER DEADLINES. Please be sensitive to the busy farmers and order on time. Late orders may not be filled! Place your order now! 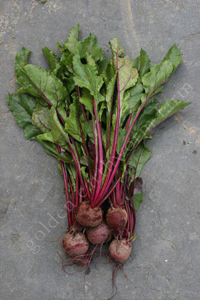 The Red Beets are small and incredibly sweet. 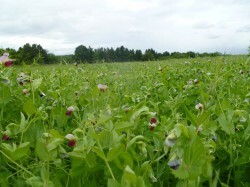 The tops are not only edible, they’re delicious too! You can cook them like spinach—they’ll wilt down quickly in a pan with some olive oil and salt and pepper. I usually plop the beetroot in a pot of boiling water with the skins on and cook til knife tender. (Roasting them in the oven intensifies their flavor, but I opt to keep the oven off during the summer.) Once cooked and cooled, the skins will slip off easily. Purple Kohlrabi is probably new to many of you. We like to call it the “Sputnik” veg because of its unusual shape. Peel the skin carefully and then you can slice raw in a salad or braise gently. I like its cabbage flavor raw in salads this time of year. Scallions are great sliced and sprinkled on any salad and the baby Arugula practically melts in your mouth. Be sure not to dress with an overpowering dressing. A light coating of good quality olive oil, a splash of vinegar and some salt and pepper with bring out its peppery flavor nicely. Finally, Cilantro! My love affair with this herb is well-known, and I can’t keep myself from adding it to every salad and bean dish (as well as chicken soup!). However, the recipe below for Halloumi with cilantro, lime and caper vinaigrette is the first recipe I make when the cilantro comes in from the fields. Halloumi is a greek cheese that doesn’t melt when cooked! You can find it at Whole Foods and some Trader Joe’s and I’ve even seen it at the local grocery after I pestered them about carrying it. The recipe calls for a sprinkling of cilantro, but I usually serve the cheese over a salad of equal parts arugula and cilantro. And finally, don’t miss out on Golden Earthworm’s pick your own strawberries! It’s likely only going to last one more weekend—this coming Friday, June 21st (10am to 6pm), and Saturday, June 22nd (9am to 5pm). PYO strawberries are $4.00 a qt for CSA members. For those already signed up for a dairy share, Pick up your dairy share! Reminder: Early bird signup for Winter Sun Farms’ winter shares continues online. The total price is $137. Read more and sign up (right now!) online. If you have a dairy share this season, remember it is a weekly share, so pick up your dairy today too! 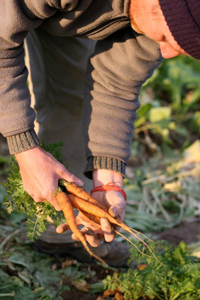 Reminder: Early bird signup for Winter Sun Farms’ winter shares are *this Thursday (June 21st)! * Bring your checkbooks. The total price is $137. Read more and sign up (right now!) online. As always, please keep in mind that the list is subject to change, depending on what’s going on at the farm. Today is a pick up for dairy! This quick recipe proves that you can replicate the favorite blue cheese wedge appetizer without consuming watery and tasteless iceberg lettuce. 1. Combine first 4 ingredients in medium bowl to blend. 2. Whisk in cheese, leaving some whole pieces. 3. Season with salt and generous amount of cracked pepper. 4. 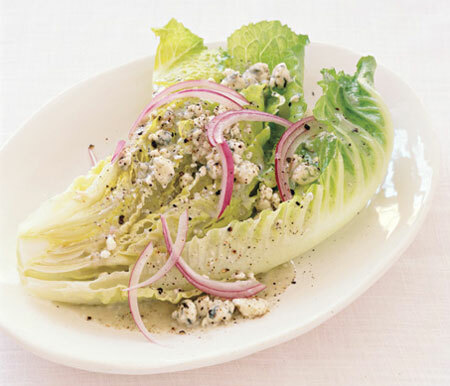 Place romaine wedges on plates. 5. Drizzle 1/4 cup dressing over center of each. 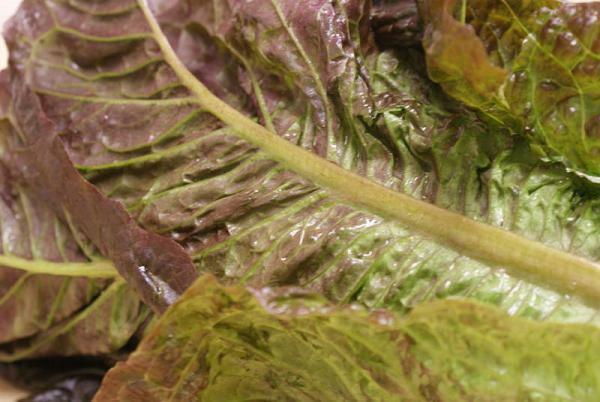 Romaine is a pretty tight “head” of lettuce with long green crisp leaves. While lettuce is often overlooked it has a alot of health benefits and Romaine leads the way with its high Vitamin A content as well as other nutrients. Lettuce came to the US in the 17th century. It was planted in California by Spanish Missionaries but took centuries to become popular once refrigeration became available and the railways were developed to deliver it cross country. 1 cup of shredded of romaine has a whopping 8 calories. It also has 1 gram each of fiber, protein, and sugar. It has a suspiciously high level of vitamin A, but after some internet fact-checking, the 81% of the daily recommended serving seems to check out! Romaine is also a good source of vitamin C, folate, iron, can calcium. Romaine is also know as Cos.
Romaine and leaf lettuce should be washed and dried before storing in the refrigerator to remove their excess moisture. It should be stored either in a plastic bag or wrapped in a damp cloth and stored in the refrigerator crisper.